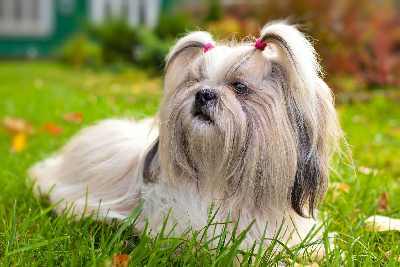 Shih Tzu Dog Breed: Could this be the breed for you? 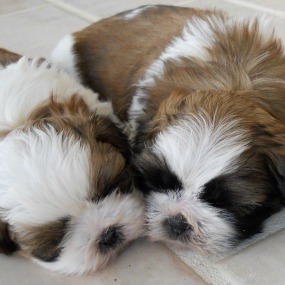 Shih Tzu Dogs are Like Potato Chips, You can never just have One! The Shih Tzu dog breed may be just the perfect breed for you, if spunky, affectionate and playful is what you are looking for in a companion. A little larger than the typical toy dogs, and slightly thicker boned, the standard sized Shih Tzu weighs in between 9 and 16 pounds. Smaller Shih Tzu dogs can be found, though, and you might see them advertised as Imperial, Miniature, or Teacup, but those are not official names in any breed registry. The Shih Tzu dog breed make excellent family pets, and do well with children. They also make ideal companions for singles and couples. Being a very flexible breed, they thrive in rural areas, suburban settings and love city life. If you need a dog that will live comfortably in an apartment, this might be the right breed. They are not considered highly yappy, but will alert you if someone comes to your home. They have a relatively low activity level, but will tolerate a daily walk if the weather is not too hot. Shih Tzu dogs do much better in cooler climates. Otherwise, most Shih Tzu dogs get all the exercise they need by following you around the house. Sometimes they get a burst of energy and will chase around like a crazy dog. They are having the time of their lives during these frantic chases. Then, just as fast as it starts, it ends and you will find your Shih Tzu sprawled out on the floor, trying to catch his breath. The breed is well documented in Chinese Art, but the actual origin of the breed is still clouded in mystery. Whether it began in Tibet or China is still debated, but it is agreed that it is an ancient breed. There is evidence that the Shih Tzu was bred in the Forbidden City and was either bred to resemble the lion or the Fo Dog, which is sacred to Buddhists. During the Chinese Revolution, the breed all but died out. Some were lucky to be smuggled out to the West. Today’s Shih Tzu is the result of crossing only seven sires and seven dames and one Pekingese dog. The inclusion of the Pekingese caused much consternation because it was introduced by a newcomer to the breed. Eventually, the Kennel Club in England accepted the breed followed by the American Kennel Club and the Canadian Kennel Club. Shih Tzu dogs want to please and will do well with owners who are attentive, positive, patient. They have a stubborn streak in them - a “well, what’s in it for me,” attitude - so food rewards usually work well. Housebreaking can be difficult and setbacks are typical. Training is best achieved if started early and consistently followed, although older dogs can be trained successfully as well. Shih Tzu have keen hearing and never miss a thing. They make great watch dogs, but don’t expect them to protect you. They are likely to lick and kiss any intruded as they show them the way to the family safe. Grooming is really the biggest obstacle to owning one of these beautiful dogs. 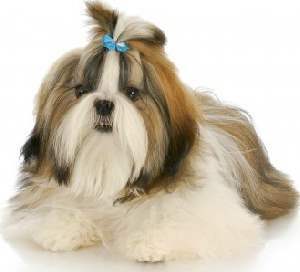 If you plan to keep your Shih Tzu in a show coat, the floor length mane with the lengthy ponytail (topknot) then expect to spend a great deal brushing, combing, bathe, and pampering. If a companion is what you want, a visit to the groomers every two months will keep the dog looking good in a puppy cut. You will still need to brush and comb, the time devoted to maintaining a Tzu in a puppy cut is far less than what you would expect to spend if you wanted to show your dog. 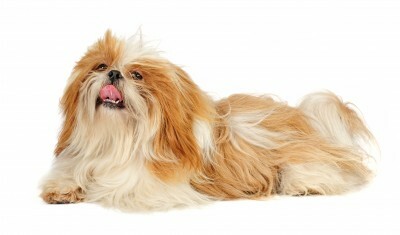 Most Shih Tzu dogs with a puppy cut will need brushing and combing every other day. A quick spritz of a hair conditioning product before brushing will protect the coat and help release any tangles or mats that have formed. Bathing should be done about every 3 weeks unless you have an especially active dog that enjoys getting dirty. This breed also need attention to the ears and face. A facial wash is ideal to keep the mustache and beard clean and free of food and other dust. The ears need to be cleaned periodically using a cotton ball and a ear cleaner. Any dog that has ears that hang low require this because they are more apt to get infected than those breeds with erect ears. A professional grooming about every two months will keep your Shih Tzu looking great. They will bathe and clip the coat, clip the nails, check ears and clean if necessary and trim the paw pads. If you want to do this yourself, you will need to include all those tasks on a regular basis. Shih Tzu Dogs are very popular with the rich and famous and many celebrities own one or more. Rocket, a Shih Tzu co-owned by Heiress Patty Hearst and breeders, Luke and Diane Ehricht won the top toy dog category at the Westminster Kennel Club Show in 2015. And, then there is Marnie The Dog, made famous on Instagram because of her adorable face and tongue that must be a foot long! Have your say about what you just read! Leave me a comment in the box below. Let me know if you agree or disagree! 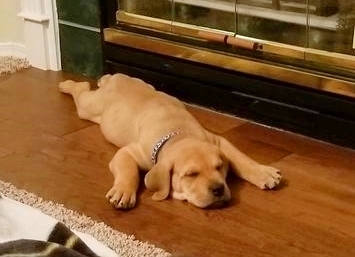 Tiny the Great Dane/Bull Mastiff pup - a growing boy needs his sleep! Tiny from Texas, USA was our March competition winner! Who wouldn't fall in love with this adorable big baby chilling out and what a great name?! Do you have a photo of your dog with a cute or funny expression? Does he/she gaze adoringly at you? Does your pooch have the most appealing eyes ever?! Arthritis in Dogs- What are the Causes, and Natural Treatments? Arthritis in Dogs. Find out what causes this painful condition, and what natural treatments are available. 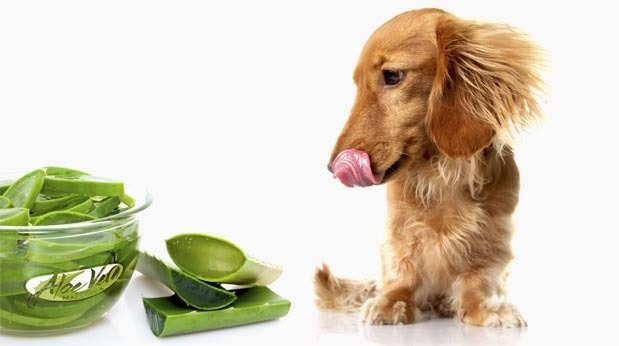 Aloe Vera for Dogs! Find out about the natural way to treat many dog conditions - aloe vera can really help!